Wonderfully kept and maintained it’s whole life by the Original Family!! This Real 442 was bought new locally by the Mom for a daily driver! This car was loving restored by the youngest son just 15 years ago. Original 455ci Big Block V8 Engine, 4 Speed Manual Transmission with Hurst Shifter. Stock Suspension is nice and tight with Factory Power Steering and Power Disc Front Brakes. Appears to have all been gone through at time of restoration. Power Windows and Power Door Locks along with a CD Player and Alarm have been added to the car. Always a Platinum (Silver) car with a Black Vinyl Top and Matching Black Vinyl Bucket Seat Upholstery. All Beautifully refinished to stock. Dash is in excellent condition, floor pans and solid and dry with zero signs of any significant repairs. Chrome and Stainless is good. Glass and Weather Stripping is nice. This is a very honest looking and feeling 442. 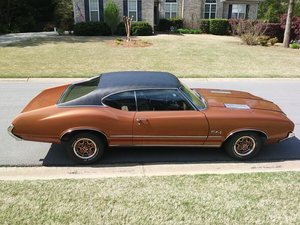 Very little use since completion this Olds is Smooth and Strong and simply a Wonderful car to Drive! Finished just the way they came off the Show Room floor. A real good investment type Muscle Car!